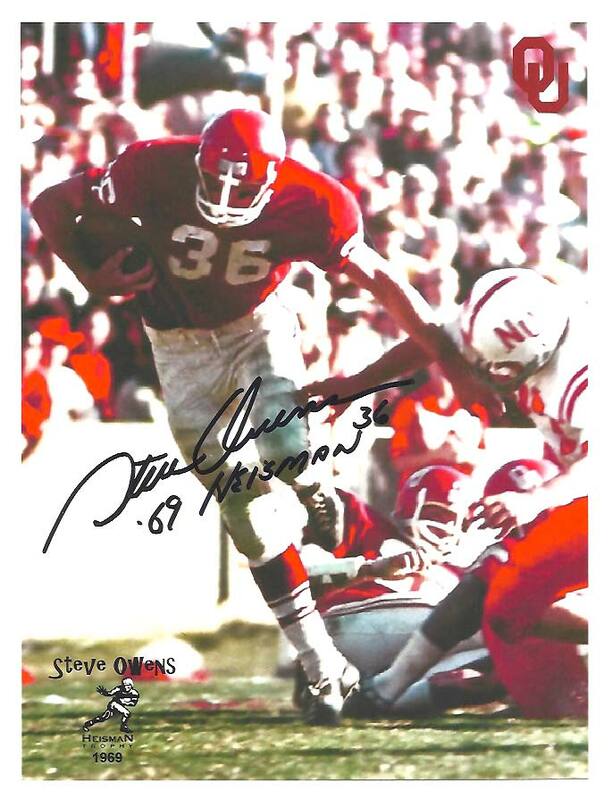 B-RAD	 10-31-2018 11-10-2018 Success 10 1/3 Sent an IC, received IC, and 2 other cards personalized to me, and inscribed '69 Heisman #36' along with a nice note! RobHarrington	 09-22-2018 10-06-2018 Success 14 2/2 Signed two cards in black Sharpie. alabamagator925	 10-10-2016 10-17-2016 Success 7 2/2 Wow, only a week and signed Oklahoma and Lions cards. Used different color sharpies to match the cards. Awesome! mazefan72	 06-16-2016 06-27-2016 Success 11 3/3 Signed an 8x10 posing with the Heisman, a Huyck graph custom, and a custom C.F.HOF card..TY again Mr. Owens!! TalleyHog34	 05-03-2016 05-07-2016 Success 4 1/1 Sent LOR, SASE, and mini helmet. First mini helmet sent. Starting Heisman helmet project. Success! First helmet TTM! bcommerce	 04-18-2016 05-01-2016 Success 13 3/3 Sent 3 Cards!! Returned all 3 Signed! bucsboy	 03-04-2016 03-17-2016 Success 13 1/2 Signed my custom IC, plus added a signed 2007 Press Pass Legends card of his own. Awesome guy! NotreDame	 01-22-2016 02-05-2016 Success 14 1/1 Sent 8x10 and added inscription. Thanks Mr. Owens! mazefan72	 12-03-2015 12-28-2015 Success 25 1/3 Signed and returned a 73 topps, and 2 IC protectors inscribed with Hesiman '69..TY! Philly4Life	 06-24-2015 07-10-2015 Success 16 1/1 Sent mini helmet, LOR, SASE and asked for Heisman inscription. Looks awesome, put Heisman 69 as asked and returned sharpie. Riggs	 04-02-2014 04-11-2014 Success 9 2/2 signed 2 8x10's with Inscriptions. tigerfan84	 10-11-2013 10-25-2013 Success 14 1/2 Sent Heisman sports illustrated. His assistant sent me note saying Billy Sims was in our office today so I asked him to sign also. Thank you!!! bcommerce	 02-04-2013 02-23-2013 Success 19 2/2 Sent 2 Cards!! Returned both Signed with Heisman Inscription! lizard-jd	 05-12-2012 06-25-2012 Success 44 1/1 Signed my Heisman pic previously signed by 8 winners - TY! bcommerce	 03-02-2012 03-16-2012 Success 14 4/6 Signed all four cards and inscribed each along with both IC's. lizard-jd	 12-28-2010 01-08-2011 Success 11 1/1 Signed my custom. RIFF RAFF 77	 11/9/18 11/16/18 Success 7 1/1 Signed I/C.